Thought I’d just share a few pics from the ice storm we had last week. It meant that we were without power for a few days, but grateful to have a generator that we hooked up less than 24 hours into the outage. Those lineman for our co-op are AMAZING! What’s your favorite part of winter? Earlier this week, I posted about the devastation that hit to the west of us. So many farmers and ranchers lost so much in the blink of an eye. People were quick to share photos and stories of heartbreak, but the questions started pouring in. 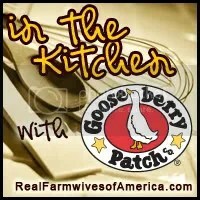 So I’m going to attempt to answer a few, from this farmer’s point of view. Please remember, these are my thoughts and reasons, but I’m hoping to give just a bit of insight. 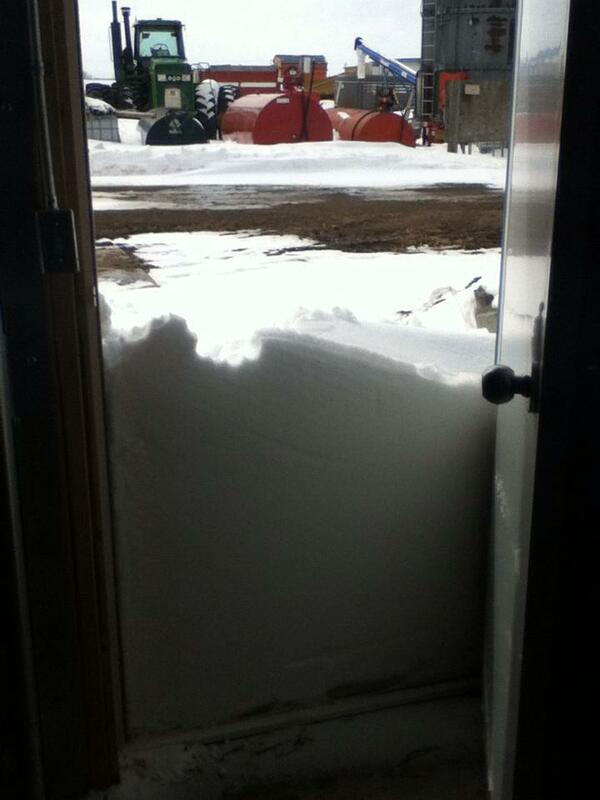 1) It’s the Dakotas, why aren’t we ready for a blizzard? Well, it’s pretty simple. Look at the calendar. It was the first week of October. And although snow is always a possibility, just about any month, the early snow falls are usually fast, wet and disappear. It was predicted to snow, but not even the most cynical of weatherman predicted it would hit that fast, that hard and bring with it the winds that were present. 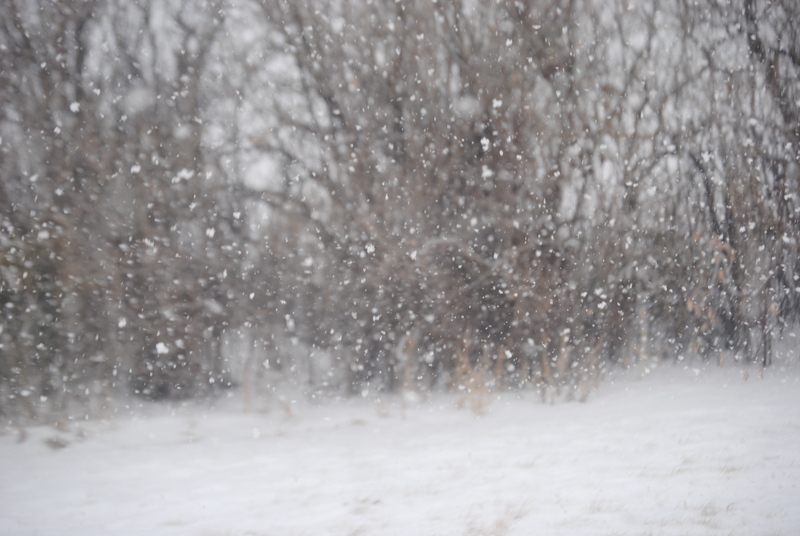 There were 26 named winter storms across the country last year, according to The Weather Channel. 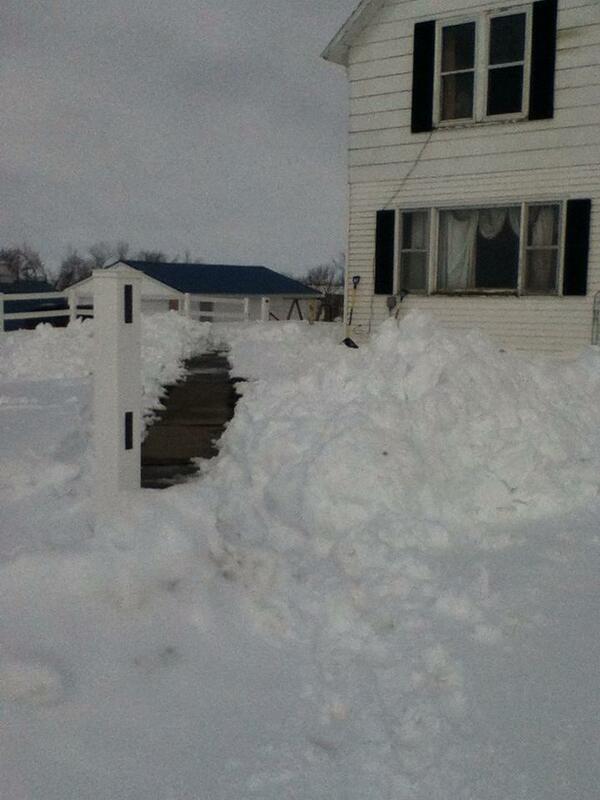 There were many, many storms that hit our area throughout the winter. We don’t usually name them, and they don’t usually impact our lives too much. This was unexpected and beyond our realm of normal. 2) Why weren’t the cattle cared for? This is plain not true. 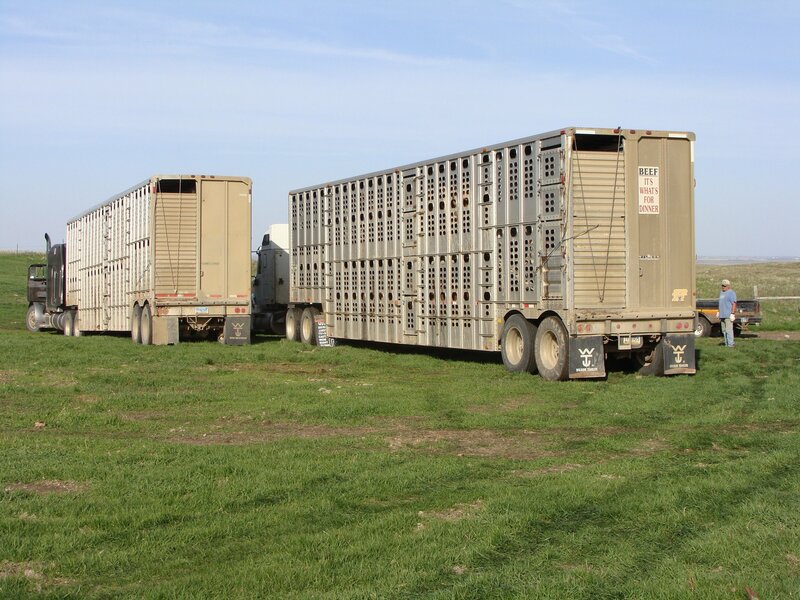 These cattle were being cared for…in just the way that many ranchers care for their cattle. A few weeks ago, I explained that our cattle spend a majority of their time at pasture. Which is just where most of these cattle were, out to pasture. Our cattle spend the summer, and part of fall, on grass. You see, in my case, our pasture is located about 15 miles from our farm. The land is hilly, rolling and wouldn’t be suited for farming. Yet it makes the perfect pasture. If a storm were to hit suddenly, and packing the punch that this one did, there is no way I could drive to the pasture, have them loaded up and brought home, and do so safely, in anything less than a day. This is how we get our cattle to and from our pasture. It takes about a day to bring them all home, or take them all to pasture. This is what our pasture looks like. Not quite as hilly as the area where the storm hit, but you can get an idea of what it would be like. 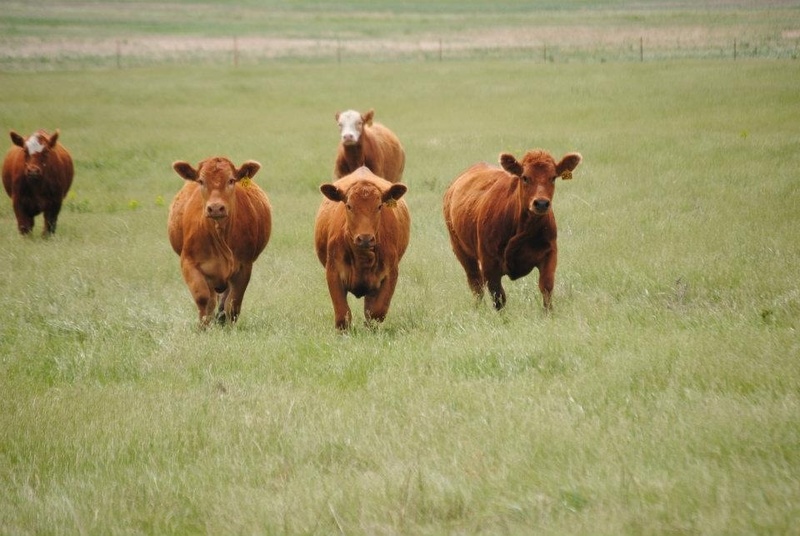 3) OK, I get it, it was a freak storm, the cattle were on grass…but why did they die? 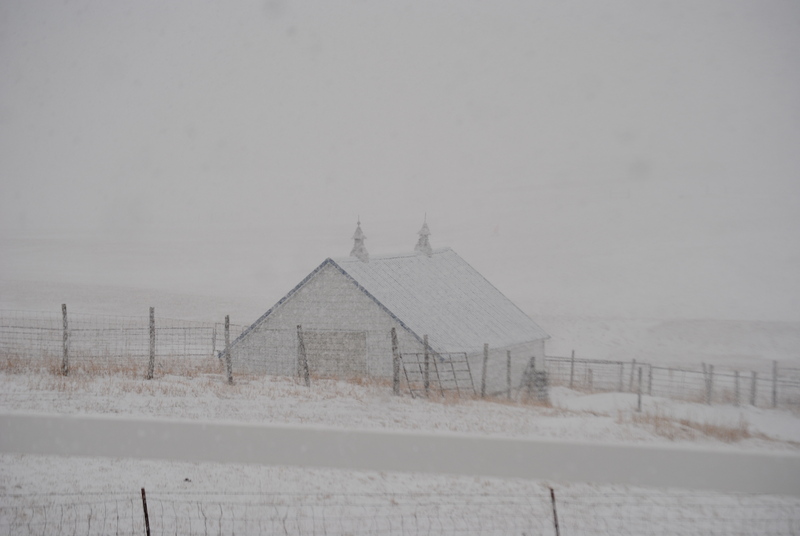 Snow accumulates and builds in drifts, much like sand dunes. And when the wind is blowing like it did, it creates very dangerous drifts. 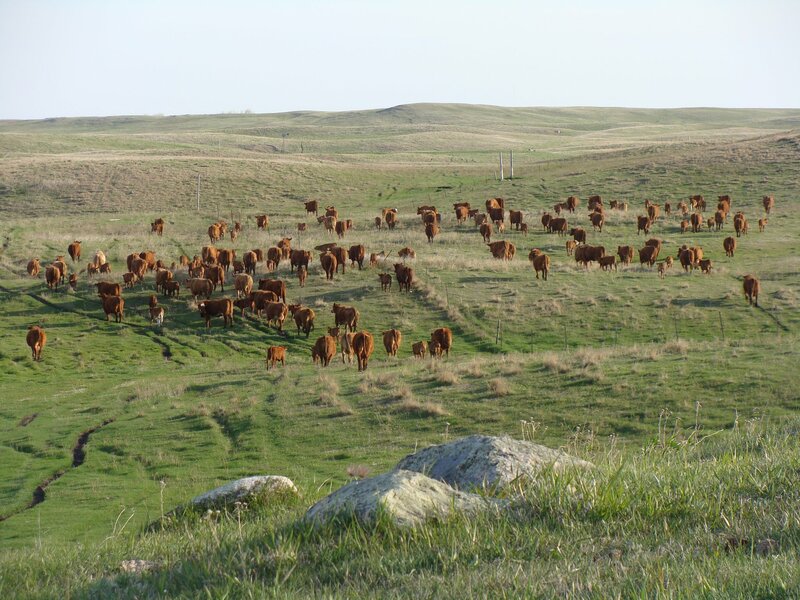 If the cattle gathered in an area that was protected from the wind, they may have ended up buried. 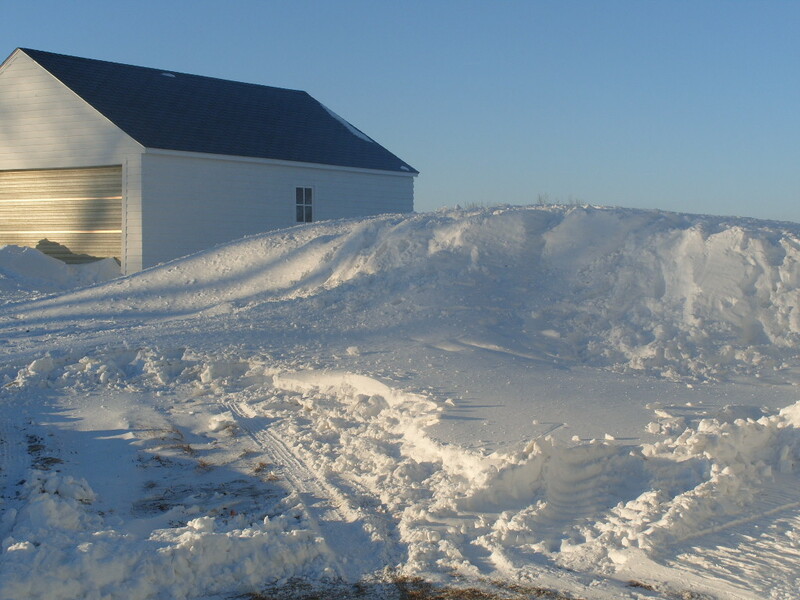 You would think that a building would provide protection from snow, but it can actually collect more snow than an open area. Here’s the one thought I would like for you to take away from all of this: We deal with these types of storms every year. It had nothing to do with lack of care or not knowing how to handle the weather…it had everything to do with timing. The fact that we handle hundreds of winter storms without a loss every year speaks volumes to the care that we provide our animals. The ranches and farms that were impacted by this storm need our support and resources to get them back on their feet. We can all help out and do our part. As I sit at my computer, typing this post and considering the challenges that face those to the west of me…all while in a severe thunderstorm watch, I can’t help but shake my head at the irony of it all. I can tell you that the farm and ranch community will rally around and do what they can to help each other out. But the fact is, we may lose a few farms and ranches…and when our numbers drop, the effect is felt throughout the country. The storm may have hit a small area, but we will all feel it. According to my calendar, we’re entering another week of government shutdowns…and it doesn’t appear as if there is an end in sight. After this weekend’s early blizzard in the upper Midwest, I have a few things that are on my mind. Apparently Mother Nature didn’t get the memo that there was a government shutdown. In fact, Mother Nature decided to show many just who is in charge…and it was a hard lesson learned. They estimate that as many as 100,000 cattle have died from the results of the massive blizzard that took many by surprise. Yes, snow in October is expected. But this was more than snow. And where is the assistance? The websites of information that could be used to help? Oh, sorry, didn’t you hear about the furlough? But don’t worry, while the government is shutdown, hosting its own two-year-old tantrum, claiming that no one wants to play fair, workers that aren’t guaranteed pay are pitching in to help, organizations are offering services to connect those that have lost cattle and those that have found cattle, setting up sites for information and tips on how to make sure your losses are reported. At a time when assistance from elected officials could be felt the most, there is no one there to answer the phone. 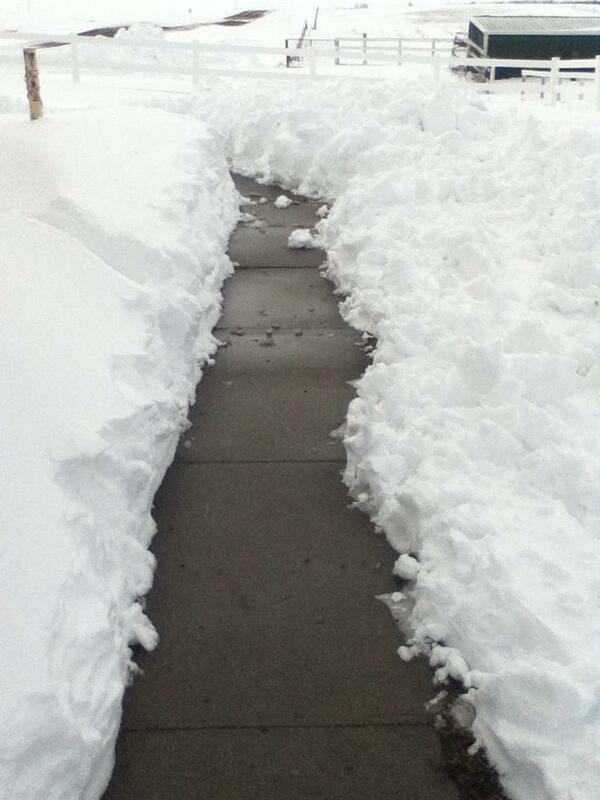 #DearCongress: Mother Nature is not on furlough. Farmers and ranchers are not on furlough. Emergency workers are not on furlough. It’s time to do what you were elected to do…grow up and represent our country, lead us to a better future, not down a path of destruction. On the plus side, perhaps this shutdown will lead many to decide that it is time to step out of the shadows and start becoming actively involved in our government. Remember, this is our government…not just the government. Run for office, whether it be township, county commission, school board, state or local offices. Let your voice be heard. Write letters. Make phone calls. It is well past the time to start charting our course back on track. We cannot go back and change the actions of the past, but we certainly can make sure that our future is a different story. A government shutdown will not have an impact on Mother Nature. But it can unite us in a drive to finally do what we should have been doing all along…be involved. So glad that April is here…I’m getting the gardening bug. So I thought I’d go out and get some things ready today. Want to come along? First, I checked my garden path. Making sure it was ready to go. Check. Went to get my gardening tools. I keep them in the shop. Good thing I have them ready to go! Check. The tulips in front of the house are almost ready to bloom! Hopefully the sun will convince them to open up. Check. 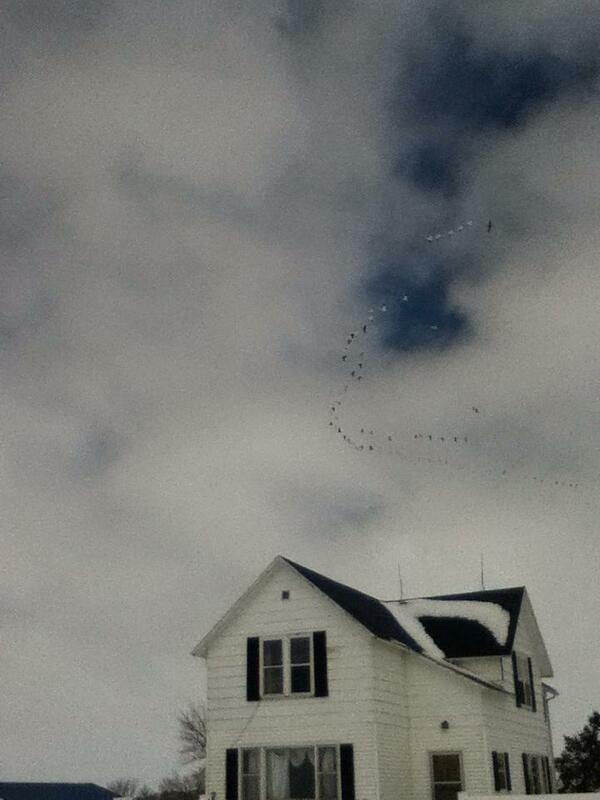 Even the geese are confused. They came north, now thinking about going south, and settled on southwest instead. I am more than ready for spring…now if spring would just show up. Mother Nature has once again given us a strong reminder about who is in control…not that I ever questioned it for a minute. Winter storm Orko arrived in full force today, bringing with it about 10 inches of snow and 40 mph winds – white-out conditions. Unfortunately, our heifers are due to have their first calves any day now, so that means that we don’t get a chance to hunker in for the storm, we must keep an eye on our livestock. 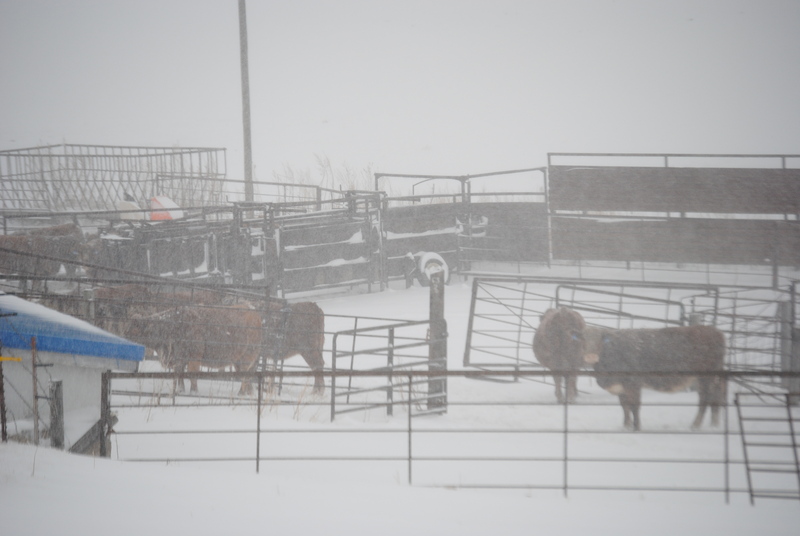 The cows stay where it’s protected during the storm. Their instincts help keep them safe…usually. Today Boss Man spent a lot of time pushing snow. Although heavy snow fall is a pain, it can be useful as well. 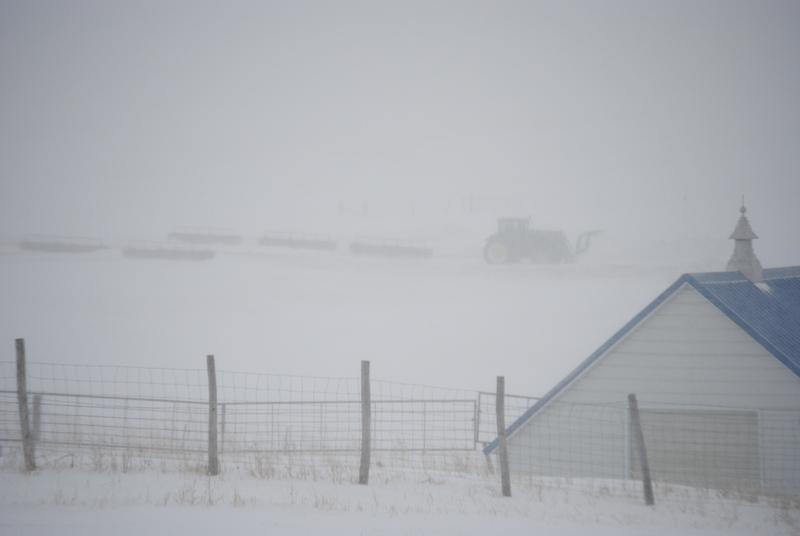 With our loader tractor, he can push the snow up into big piles, creating natural windbreaks for our cattle. As long as it’s here, we might as well put it to use! Boss Man making a windbreak with the snow. My mistake? Thinking I was going to make a quick trip down to the calving lot and not suiting up properly. Instead of coveralls and the whole get-up (fashion plays little in calving), I just slipped on my Bogs, my jacket, hat, scarf and gloves. It wasn’t too bad, until I started fighting thigh-high drifts. Even then, it wasn’t terrible…except when I started losing my balance in the wind and snow. Then I was working so hard trudging through the snow that I was melting the snow stuck to my yoga pants, soaking me clear through. I was chilled to the bone! A colossally stupid move on my part. Really. I’m guessing I’ll sleep like a baby tonight, but may have a sore muscle or two tomorrow. Anyone looking for a great cardio routine? I think I found one! We’re getting geared up for calving to start in just about two weeks, which means that we could have calves any day now. And just to remind us who’s in charge, Mother Nature gave us a little wake-up call today. We’re hoping all the calves stay where it’s warm until this front moves through! Winter weather is upon us! Visibility is dropping, but the temperatures are staying mild. George was excited to see the snow at first, but has changed his mind now. He’d like to go swimming. You know, 3-year-olds…they keep you on your toes! This wasn’t the post I intended to write today. These weren’t the pictures I hoped to share. But Mother Nature has a funny way of deciding what does and does not happen. Last night, shortly before I was planning to go to bed, the TV warned of a storm that was heading towards our area. 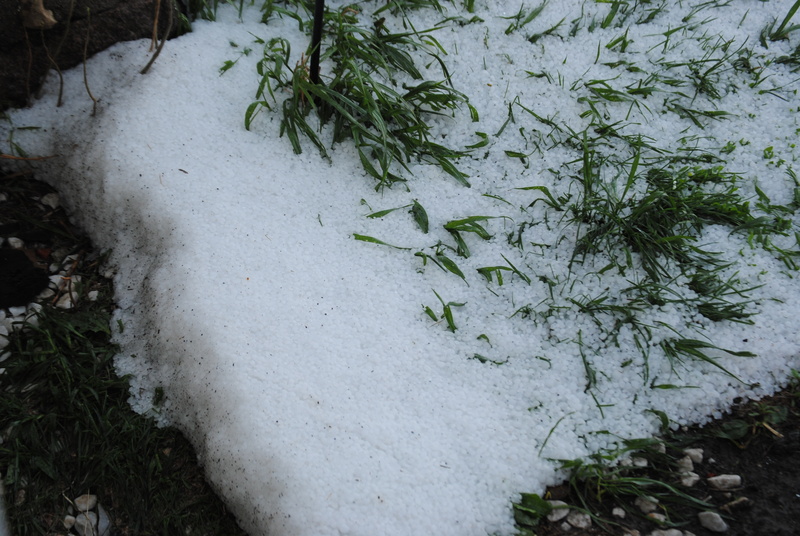 They stated that it had heavy rain, some hail and strong winds. I joked on Facebook that it better go around, because I wasn’t in the mood to deal with a storm. The first storm hit about 10 p.m., and although at first seemed to not be that bad, it quickly changed its tune. 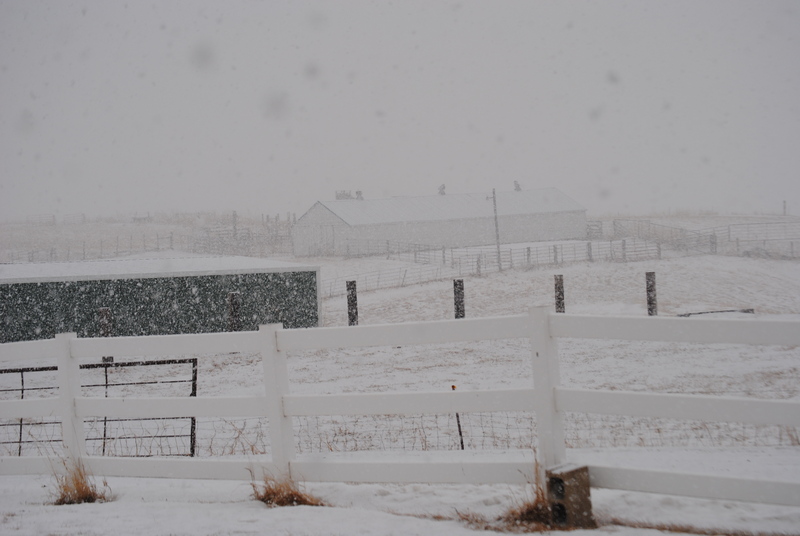 We had a lot of hail, wind took down sections of fence and spun our calf shelter, killing one calf and injuring another. 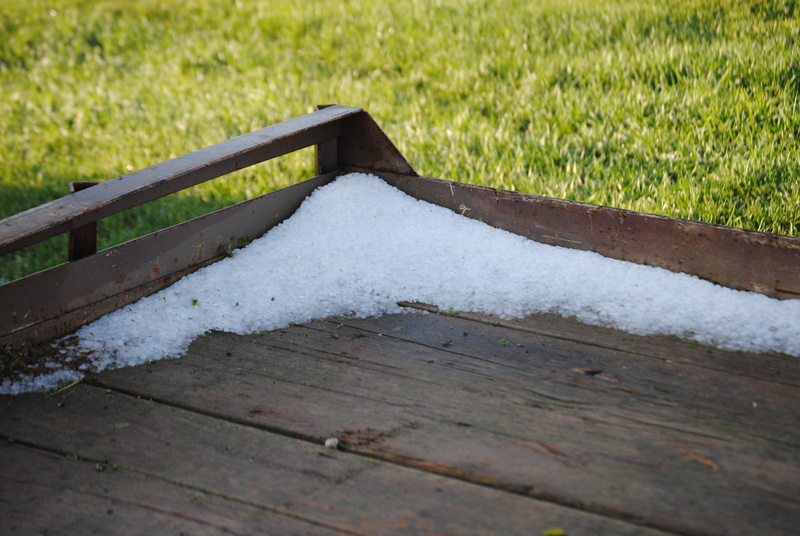 Hail out our door last night, storm #1. I thought that was it, and went to bed, knowing there wasn’t anything we could do during the night. 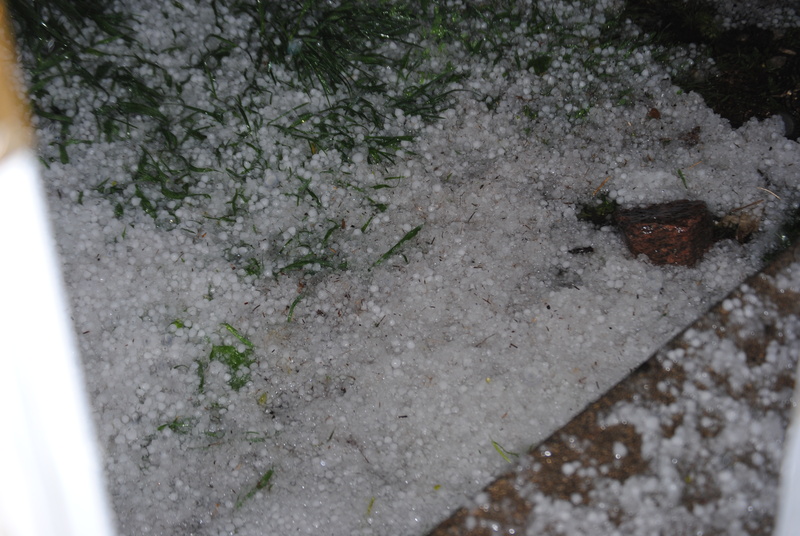 And then at 4 this morning, another storm came through…bringing more hail, more wind, but thankfully, no more destruction. 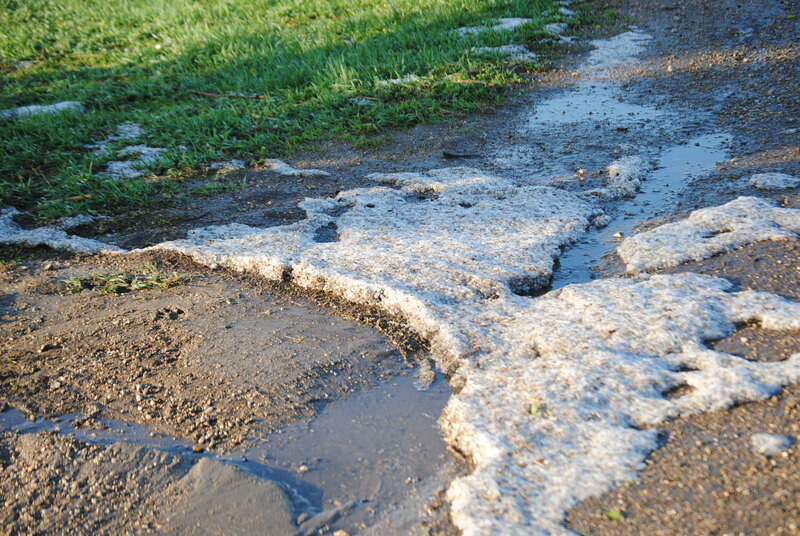 Drift of hail left yet this morning. This calf shelter is supposed to protect calves, not hurt them. 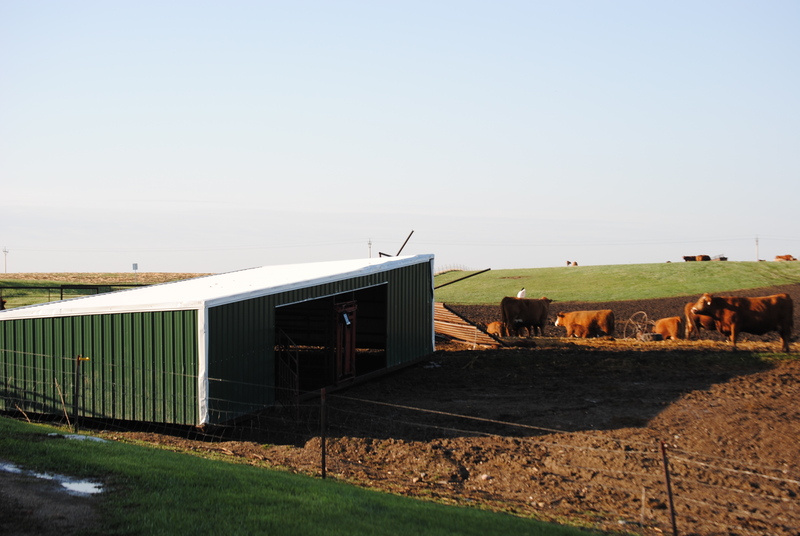 But the storm last night rotated this shelter to the north 90 degrees, killing one calf in the process.